Dubai, UAE, January 3, 2016: Braun, the world’s leading electrical goods manufacturer, has launched every home cooks’ secret weapon: the Multiquick 7 Hand Blender. 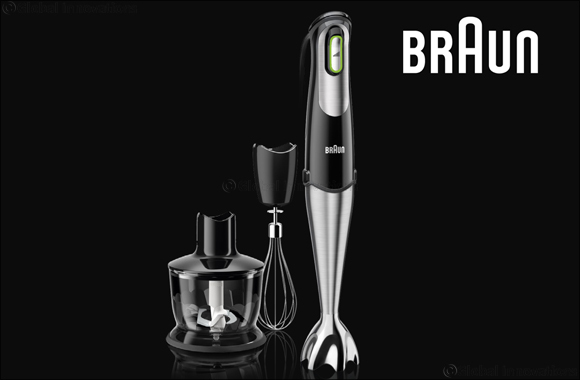 Combining its design talents and technical expertise, Braun has created the world’s first hand blender to feature the Smart Speed control – a revolutionary technology where the more you squeeze, the more the power increases. The speed of the hand blender is increased by pressing the speed regulator button on the handle, allowing easy preparation of favourite recipes with just one hand. The speed is changed in real time, without any interruptions to the food preparation process. Braun is the worldwide market leader in the hand blender category, and has created the Multiquick 7 with the end user in mind. The Multiquick 7 blends powerfully, efficiently and effectively and its unique design makes it easy to use and store in the kitchen. The extra-large, intuitive smart speed button allows the blender to be gently started up and slowed down as needed, with stepless adjustment of the blending speed to prevent splatter of puree in the kitchen. The ergonomically angled switch gives the index finger a secure hold, ensuring the precise transmission of power. The soft grip handle makes it comfortable to hold and easy to control, while the patented PowerBell – a combination of ultra-hard stainless steel blades and a unique blending bell shape – tackle the multiple food processing needs. The blender also includes a series of attachments, including a whisk and a food processor, ensuring every meal, from appetizer to dessert, is made quickly and easily. Smart Speed: The more you squeeze, the more power you get. Effortless, single-handed use changes speed without interruption. PowerBell: Patented hand blending technology proven to produce finer, more even results. Provides extra light, simple activation and anti-splash design to ensure a spotless kitchen. EasyClick: Patented design ensures that all attachments can be removed in one simple click. Whisk: Whips, beats and easily stirs eggs, cream and fluffy dessert from low to high speed. Food Processor: Chops, slices, shreds and kneads. Beaker: 600 ml plastic beaker, BPA free, with ml and floz measurements. Braun’s products are carefully conceived and developed using German standards of high quality, expressing the engineer’s dedication as well as the passion that employees bring to creating perfectly manufactured products. With the aim of simplifying consumers’ daily lives, the versatile range of products meld innovation, functional design, timeless aesthetics and long-lasting reliability – qualities that can only be achieved through close cooperation between design, development and construction. To guarantee the high quality standards, each device is thoroughly tested, starting from the development phase to the end of series production, ensuring products are long-lasting and function flawlessly.